The quality of software and systems depends largely on the quality of the requirements on which they are based. The quality of software and systems depends on the quality of the requirements that it is based on. objectiF RM offers requirements quality assurance as well as verification of other requirements engineering results and documents. objectiF RM provides support for working in distributed teams. This includes the option to have project participants and stakeholders participate in reviews wherever and whenever and with or without objectiF RM installed. You can present individual elements to a group of reviewers – so requirements or stakeholder goals, use case, test cases, risks and documents for a review. Review objects can also be a whole group of elements that represent the same development state. The reviewer receives an automatic message that the review begin. The new review appears in the personal to-do list of each reviewer. The reviewers can perform the review at any time. Stakeholders who do not have objectiF RM installed can just use a web browser. Each reviewer gives a comment on the review object. Acceptance or rejection are signalized through setting a state. The personal to-do list of a reviewer (above) and the list of all planned reviews (below) provide an overview of reviews with the expiry date and current editing state. What happens to a verified element, for example, a requirement independent of review results? That can be specified by coordinating the state machine between reviews and requirements. What happens by default can be seen here: A requirement changes into the state approved when all reviewers have approved it. 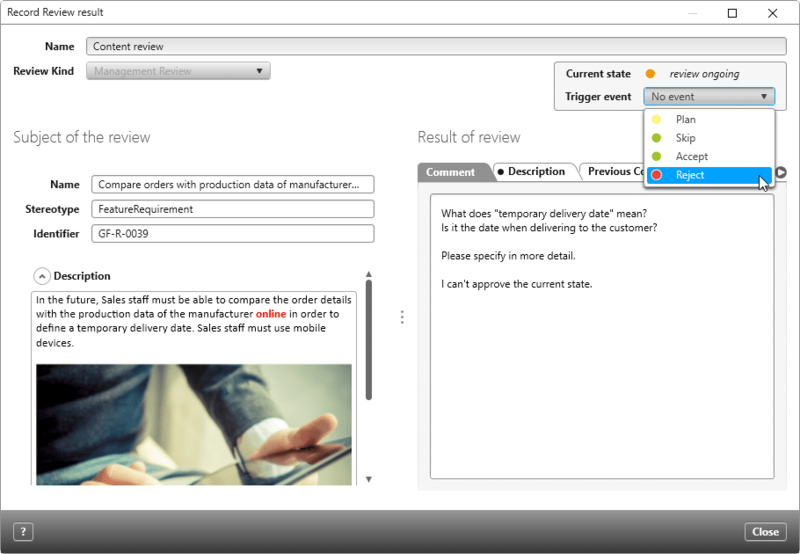 How to collect review comments: Information about the review object can be found on the left, on the right is the entry field for comments and up the top rejection or acceptance is documented. Rejecting a review changes the entire review into the state rejected. 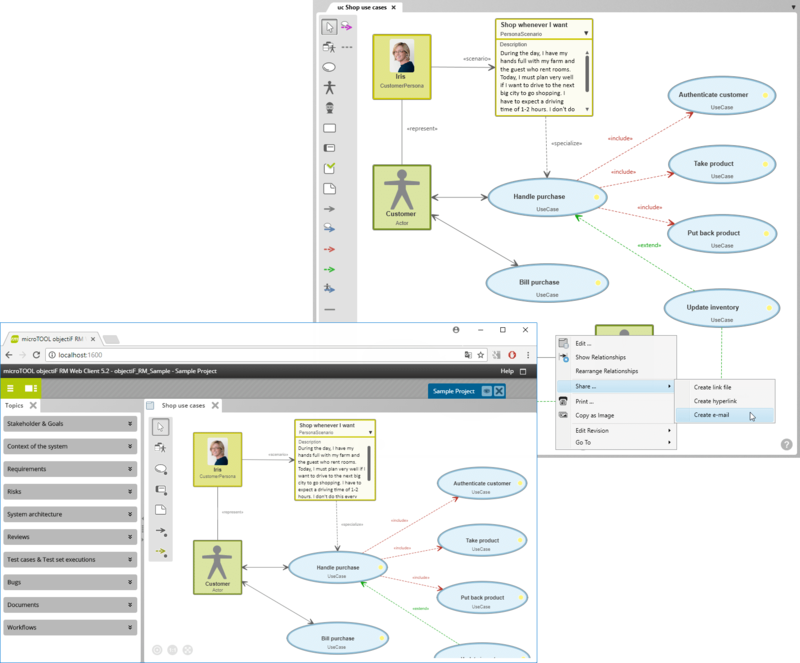 The workflow for asynchronous reviews of goals, requirements, risks, documents, use cases and element groups can be tailored to your organization. Ongoing and planned review processes are transparent through real-time evaluations and email notifications of states. It doesn’t always have to be a review. 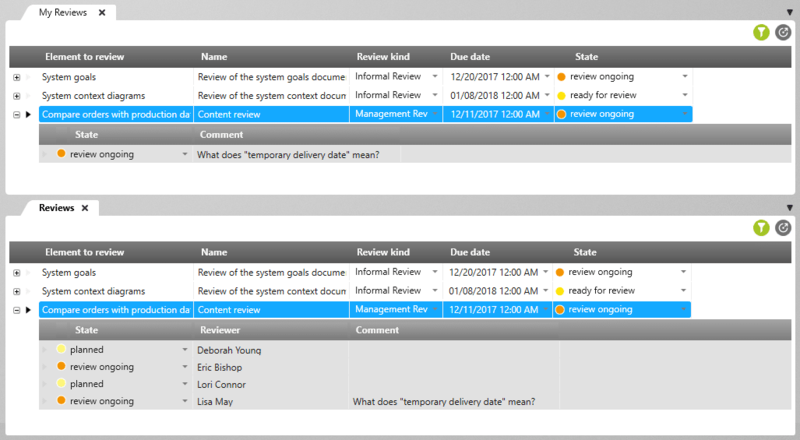 Sometimes one more comment from a colleague or a stakeholder helps – for example on a requirement, a risk description, a diagram, a document, a list of test cases or controlling information on your dashboard. Or do you need the okay for a document from an external partner who does not have access to the project? Share contents within a project. 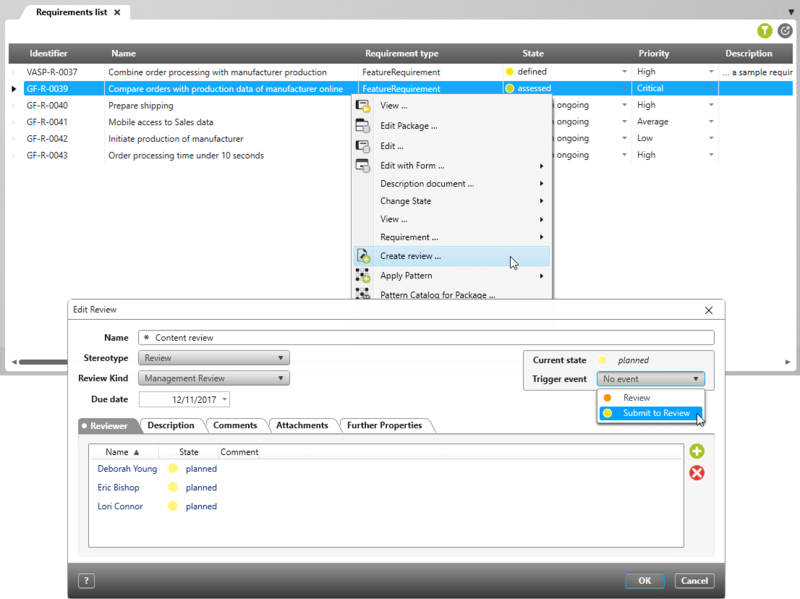 Or if the software is not installed on their computer, they can open the project and the shared element in the objectiF RM web browser. Stakeholders who do not have objectiF RM installed can easily be included in communication, reviews and accepting results. 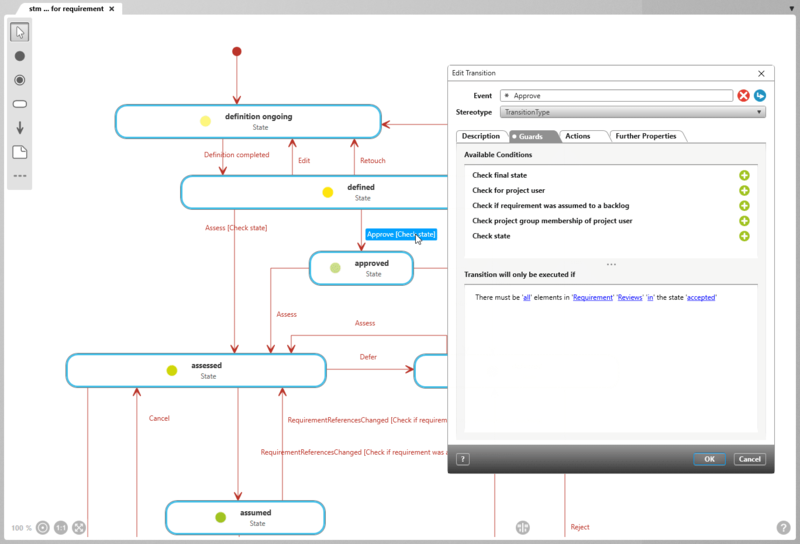 Do you want to get a colleague’s feedback on a use case diagram, for example? Then send an email with a hyperlink and a link file – both are generated automatically. When your colleague uses the hyperlink in their web browser, then they will see the use case diagram as pictured here. Of course, corrections can be made directly in the web browser.